Teddy bear clothes, teddy bear boy outfits and sets clothes fit boy build a bears factory teddies. Compatible fit for 14-16" build a bear and many more popular brands. Probably the best selection of Teddy bear clothes you have seen! 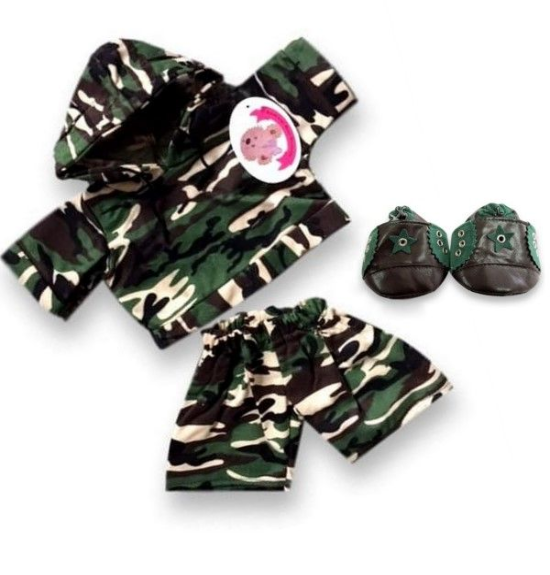 Teddy bear clothes blue camouflage hooded top jog pants outfit A compatible fit for Build a Bear, Argos Design a Bear and many more teddies of a similar shape and size. Outfit includes blue camo hoodie with matching Jogging Trousers , these have a tail slit. Teddy bear clothes boom t-shirt denim shorts comes with denim back pack accessorie. Build your bears a new wardrobe of teddies clothes. Teddy bear clothes compatible fit for 16 inch Build a Bear and Argos Design a Bear. One eye monster all-in-one with matching slippers, teddy bear clothes a compatible fit for Build a Bear, Argos Design a Bear and many more teddies of a similar shape and size. Teddy bear clothes red surfer outfit a compatible fit for Build a Bear, Argos Design a Bear and many more teddies of a similar shape and size. Teddy bear clothes red football kit outfit. A compatible fit for Build a Bear, Argos Design a Bear and many more teddies of a similar shape and size. Teddy bear clothes red bug all-in-one with matching slippers, fleece red fabric. Outfit is a compatible fit for Build a Bear, Argos Design a Bear and many more teddies of a similar shape and size. Teddy bear clothing. Black Bat Hero Cape All-in-one. Teddy bear clothes a compatible fit for Build a Bear, Argos Design a Bear and many more teddies of a similar shape and size. 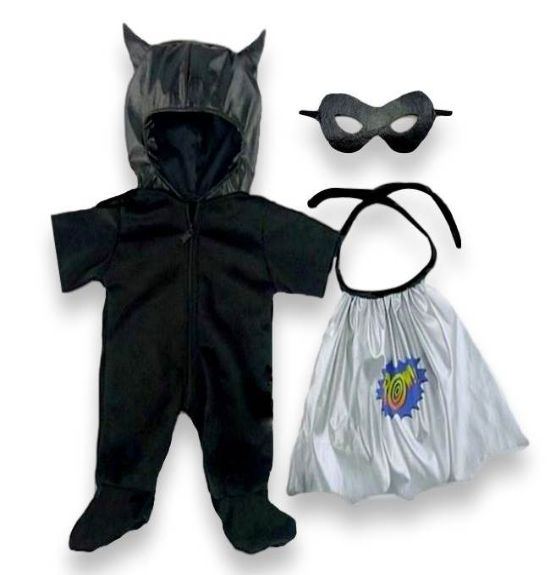 Teddy bear clothes black hooded outfit. A compatible fit for Build a Bear, Argos Design a Bear and many more teddies of a similar shape and size. Teddy bear Builder Construction Outfit, includes vest and Hat. a compatible fit for Build a Bear, Argos Design a Bear and many more teddies of a similar shape and size. Spider hero teddy bear clothes a compatible fit for Build a Bear, Argos Design a Bear and many more teddies of a similar shape and size. Teddy bear clothes outfit. A compatible fit for Build a Bear, Argos Design a Bear and many more teddies of a similar shape and size. Green dinosaur outfit teddy bear clothes a compatible fit for Build a Bear, Argos Design a Bear and many more teddies of a similar shape and size. 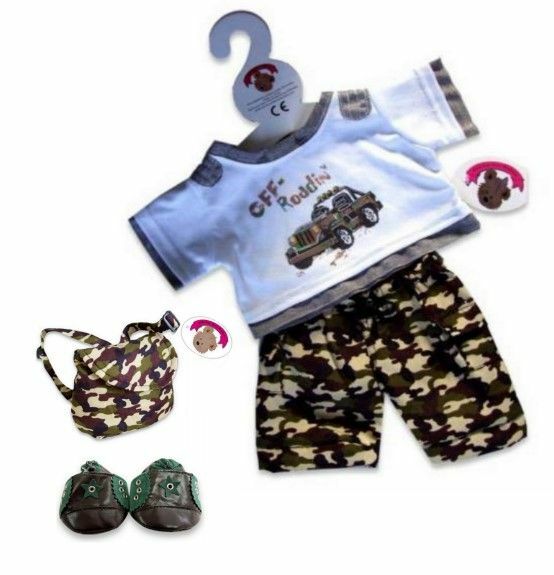 Teddy bear clothes surf short, white t-shirt wth surf board detail this outfit includes goggles. A compatible fit for Build a Bear, Argos Design a Bear and many more teddies of a similar shape and size. Christmas, Santa's Helper outfit. T-shirt, jeans outfit with Santa hat a compatible fit for Build a Bear, Argos Design a Bear and many more teddies of a similar shape and size. Teddy bear clothes blue t-shirt with dog detail denim jeans, a compatible fit for Build a Bear, Argos Design a Bear and many more teddies of a similar shape and size. Teddy bear clothes Dino outfit. A compatible fit for Build a Bear, Argos Design a Bear and many more teddies of a similar shape and size. Teddy Bear Clothes fits Build a Bear Teddies and Dolls, Army Green Hooded Outfit. Compatible for Build a bear and Argos Design a bear, plus many more popular 38-40 cm 15-16 inch bears.